The tool is installed in the following directory path /opt/mssql/bin let’s explore what mssql-conf is all about. 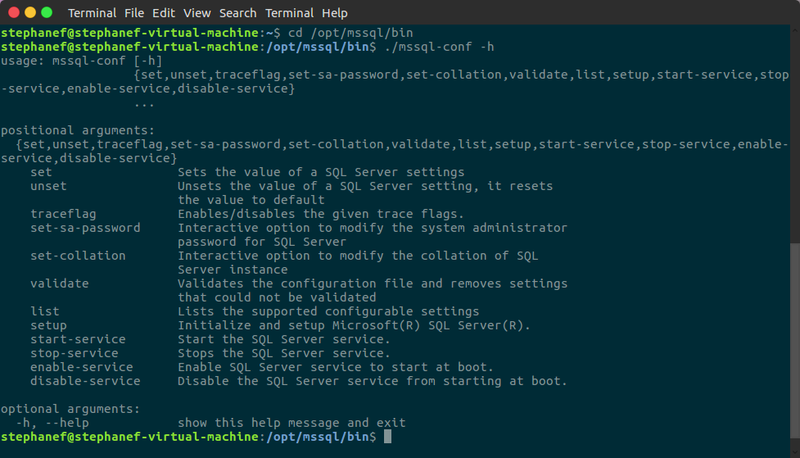 This command gives us various the options/arguments that we can use with the mssql-conf tool. This option will let you change the TCP port where SQL Server will listen for connections. By default, this port is set to 1433. By default, the backup files are generated in /var/opt/mssql/data. I personally like to store my backups in a directory named ‘backup’ 😉 So we will need to create a new directory (folder) and then change the default backup directory. List files and directories -> ls -l backup directory does not exist! To see the content of the mssql.conf file, you use the cat command which stands for “catenate”. It reads data from files, and outputs their contents. It is the simplest way to display the contents of a file at the command line.